I'm a face mask addict, it doesn't matter if it's a sheet mask, sleeping mask or washable mask - if it's interesting mask I'll try it! I've tried The Body Shop Chinese Ginseng & Rice Clarifying Polishing Mask but today I'll focus on the entire The Body Shop Superfood Mask series. 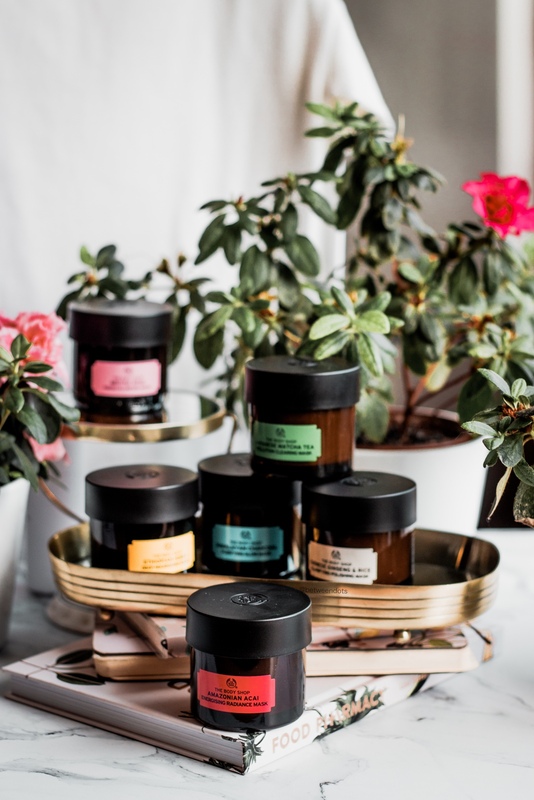 In this post, we will visit Japan and look deeply into the tea and beauty rituals in Japanese Matcha Tea Pollution Clearing Mask, next stop - India where we are going to focus on Ayurvedic Traditions in Himalayan Charcoal Purifying Glow Mask. From India, I'll take you to Ethiopia, where we are going to check one of the latest trends - marula oil in Ethiopian Honey Deep Nourishing Mask. We can't forget about visiting Europe, this time let's take some time for a tea and visit rose gardens with British Rose Fresh Plumping Mask. To make it more exciting we will go wild! Let's visit Amazonia and try acai berry in Amazonian Acai Energising Radiance Mask. We will also go back to China to see if there's any difference in ginseng and rice after such a long time. So are you going on such exciting trip with me and The Body Shop? Fasten your seatbelts and let's go!